This entry was posted on Wednesday, May 21st, 2014 by Frances Ryan. Nine years ago today, I stood in front of God and my family and friends to profess my love and devotion to the man I expected to spend the rest of my life with. As it turns out, we had a little less than four years before he went ahead to meet God without me. I never would have anticipated the loss at the time—I never even anticipated the loss when it happened—but still, I would have stood there promising to love and cherish ’til death do us part. I’d be lying to say that my wedding anniversaries are just meaningless days now. But I’d also be lying to say that they have the same meaning as they did when Paul was here to celebrate with me. Instead, the 21st of May is a poignant reminder of what once was, and what we’d dreamt would be. It’s a day of happy memories of the love-filled days we shared, and a day of sad reminders of the days that were stolen from us when he died just five years ago. I imagine that if Paul were here, we’d exchange cards and gifts in the morning, and then we’d go about our individual work days before celebrating together with a nice meal. Of course, by now we’d have our happy little family (we were in the process of adoption when he died) so maybe we’d include the kids in our celebration. Who knows! But Paul isn’t here so there won’t be cards exchanged. There won’t be happy memories shared or excited hugs and kisses as we celebrate another wonderful year of marriage. No, for my ninth wedding anniversary, I’m just going to try to muddle through the day as best as I can. I will be spending much of the day in training sessions for my PhD then—assuming I’ve not had an emotional meltdown that makes me go straight home—I am going to treat myself to an evening of pottery painting (pottery being the traditional ninth anniversary gift) followed by a dinner out somewhere. 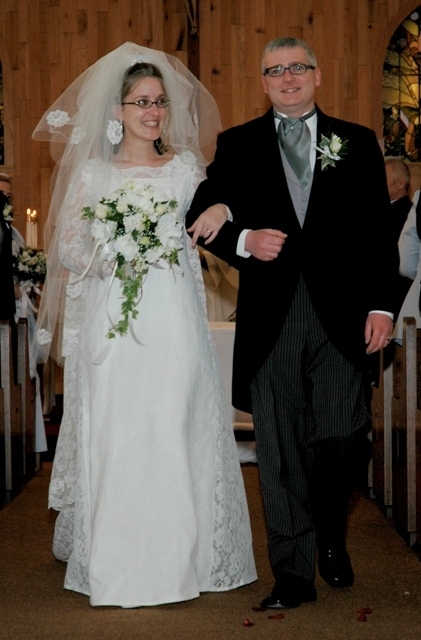 Yes, nine years ago today I became Mrs Ryan. It was by far the most blessed day I’ve lived as it was the day someone said they loved me enough to spend the rest of their life with me. And one day, we’ll spend our eternities together, too. you were such a beautiful bride and your paul looks so happy too. i know these days are hard for you but you’re not alone. we are all here for you. Thanks, Candy Man. It’s wonderful to know that I have so many people all over the world who are here for me - even when they’re there! Love you!